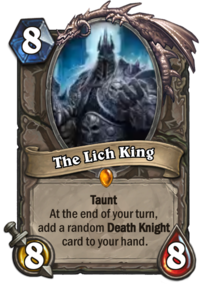 Today we're going to look at the remaining neutral cards that have been released since my previous reviews, including the Lich King himself. The expansion is going live on Thursday, the 10th of August! Here are the remaining common neutral cards. There are quite a few of them. represent. But not very well. she's forgotten all the poetry. house, it's time to move. is what you get on the inside. 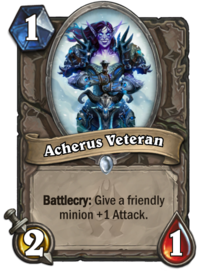 The Acherus Veteran has the stats of the Abusive Sergeant before it was nerfed, but a strictly worse Battlecry. As long as they don't get pinged, 2/1 minions are good for trading into bigger minions (there are plenty of 3/2 and 2/2 2-Mana minions you could trade into), so you could play Acherus Veteran as a turn 1 play onto an empty board, possibly baiting your opponent into inefficiently using Mana to ping when they need to be developing their own board. That being said, decks that play Abusive Sergeant have plenty of 1-Mana minions that are also 2/1 minions, so the real value of the card is its Battlecry. I wouldn't substitute this card in place of the Sergeant. It's a Poor card at best. 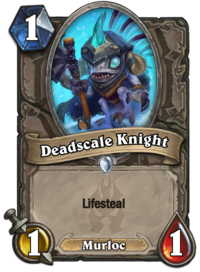 The Dreadscale Knight wins amusement points for being a murloc death knight. Beyond that, unless it's buffed, it's just not worthwhile. Generating 1/1 tokens from spells or triggered minion effects is often very powerful. A 1/1 minion taking up a card slot has to add value to your deck and contribute to its overall gameplan (such as, say, giving your Devilsaur Egg +2 Attack). Lifesteal is a solid mechanic, but it's wasted on a 1/1 body that takes up one of your precious deck slots. (It's worth contrasting with the Righteous Defender that paladins get - Divine Shield gives it an extra layer of durability that makes the card worthwhile.) Just Terrible. The Wretched Tiller actually has a really good triggered ability. It's too bad it's attached to a 1/1 body. If you're playing a deck that buffs minions (druid board flood or paladin Grimy Goon buff decks), you could make it work, although you'll almost always have a better option. Otherwise, give this Terrible card a pass. The Tainted Zealot has Divine Shield, which is nice, and Spell Damage +1, which is okay (if underwhelming), and costs 2 Mana, which is decent for Divine Shield and Spell Damage. The problem is that it's a 1/1 minion. Given the Divine Shield and Spell Damage, this is entirely predictable, but it's just too weak for what you get. (Of course, Spell Damage is a mechanic that very rarely sees play, except for Malygos, usually in combo decks that relied upon him for sudden, game-ending burst damage, Bloodmage Thalnos, who gets included in decks because of his Deathrattle, and Azure Drake, which gets included (in Wild decks only, of course) because of its Battlecry. Tempo mage decks, which you're not seeing much of these days, liked running Cult Sorcerer because of her aggressive stats and synergy with Flamewaker and all the tempo damage spells. Freeze mage decks in Wild format often run Evolved Kobold to give their endgame burst damage the oomph it needs to burn down a full-strength opponent. But those are pretty much it. Again, it's worth contrasting with the Righteous Defender. Divine Shield and Taunt are useful, synergistic effects. Spell Damage, not so much. Write this card off as Terrible. 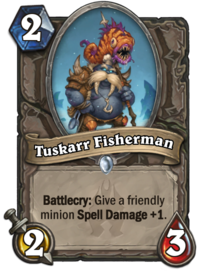 The mechanical poverty of Spell Damage as a mechanic also does for the Tuskarr Fisherman which has a pretty standard 2-Mana body and bestows Spell Damage on an adjacent minion. Just about no one ever plays Ancient Mage, the card that gives Spell Damage to two adjacent minions, so I don't expect Tuskarr Fisherman to see much play. I could be surprised, though. 2 Mana might just make it work (barely), although you'll feel bad playing it on an empty board. Overall, though, it's still Terrible. Hyldnir Frostrider joins Arcane Golem, Ogre Brute and Dancing Swords in the exclusive club of 3-Mana 4/4 minions. 4/4 for 3 Mana is a really good body for the Mana cost, so of course there is a downside. 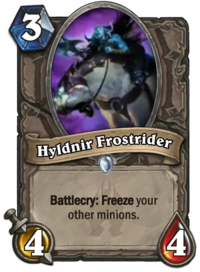 Unlike its fellows, Hyldnir Frostrider's downside can be avoided by playing it onto an empty board. You can play it on curve after trading in your existing board and feel pretty good. That being said, its downside is so bad that it can sit in your hand if you draw it later in the game and have a decent board built up. The downside is sufficiently painful for this card to remain in the basement of Terrible cards. Next up, the Vryghoul. It's an incredibly fragile body for 3 Mana. 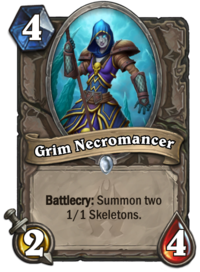 The deathrattle means you get 5/3 in stats for 3 Mana, which isn't actually that bad, but the way they're spread makes this a poor choice. The base minion dies too easily, and the body you get after the Deathrattle is uninspiring. What's more, the deathrattle only triggers on your opponent's turn, giving your opponent an incentive to ignore this minion for as long as possible, forcing you to trade with it yourself, wasting the deathrattle. In other words, another Terrible card. 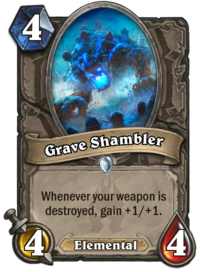 The Grave Shambler has an interesting effect, buffing itself whenever one of your weapons is destroyed. The upside is that this includes when it's taken out by Bloodsail Corsair, a weapon-eating ooze, or Harrison Jones. You can even play this on curve, then swing with your weapon's last charge to buff it right away. This could actually work out surprisingly well with Rogue, whose Hero Power, you will recall, equips a weapon. Most other decks only run two weapons, and occasionally three, and the decks that run more weapons will never run this minion because it's insufficiently aggressive. This card can't reasonably be rated any better than Poor, and even then only because of the niche use by rogues (which, given its rating, you won't see very often except in the most quixotic of decks). The Grim Necromancer is a straight-up upgrade of the Dragonling Mechanic. That won't be enough to make it see regular play. That being said, it could see use in a board-flooding druid deck that plays plenty of board-wide buffs, because the tokens it generates could then become quite robust. Even then, though, it's competing against Violet Teacher for the 4-Mana slot (and that's assuming board-flood druids are even playing minions as expensive as 4 Mana), so even though it could, it won't. If the tokens were themselves 4-Mana minions, it could work in an Evolve deck, but I'm sure they'll be 1-Mana minions, so that's not happening either. If you're playing either of those decks on a budget, it would be serviceable, so it can get away with a Poor rating. 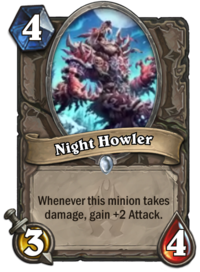 The Night Howler has the same mechanic as the Gurubashi Berserker. At 1 fewer Mana, it is a substantially worse card than the Berserker, gaining one fewer Attack each time it takes damage, and having 3 less Health with which to absorb damage for the Attack buff. The additional point of base Attack just doesn't make up for it. It's Terrible. 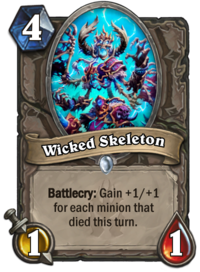 The Wicked Skeleton has a powerful self-buff effect. Its base stats are so low for its cost, however, and setting up a big buff when you have it in hand is such a finicky process, however, that I suspect you'll very rarely see value for it. 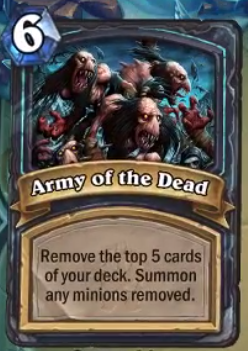 In order to be worthwhile, you need to play this after at least four minions die to make it a 5/5. It's also hard-countered by all shaman decks, by control-oriented mage decks, and by at least one currently-popular priest deck. 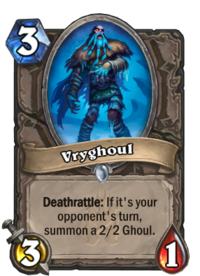 Is it worth having this in your deck to bait out a Hex, Devolve, or a Silence card? I don't think so. Chalk it up as another Terrible card. 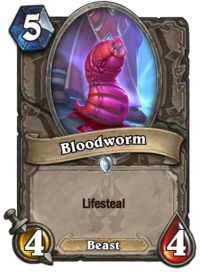 The Bloodworm is a minion with Lifesteal, which I think is a fine mechanic. The problem is that it's a 5-Mana 4/4, which is a very poor statline for the Mana cost. You have to have an exceptional additional effect to make it into a deck with that cost/body combination. Azure Drake, Druid of the Claw, Grimestreet Enforcer, and Shadowcaster are about the only 5-Mana 4/4 minions that either see regular play, or once saw regular play in now-disfavoured decks. (The Druid of the Fang and Kvaldir Raider were occasionally encountered, but on a far more marginal basis.) As much as I like Lifesteal, I don't think it's enough to make the cut. This is a Poor card. 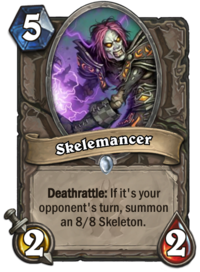 The Skelemancer is a hard counter to Doomsayer, and to board clears generally. It's an upgrade on the Twilight Summoner: for 1 more Mana, the base minion's stats are upgraded by +1/+1, and the minion that spawns after the rattle is a massive 8/8 monstrosity. 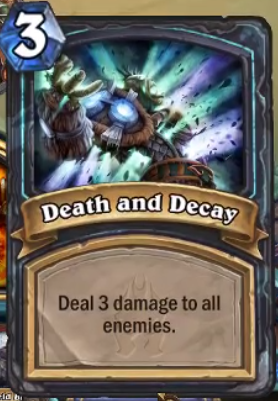 That being said, the Deathrattle means it struggles against decks that don't run board clears or interact much with the opponent's board (such as Pirate warrior), and at 2/2 the base minion just isn't a big enough threat. It's also very vulnerable to Silence and Transform effects, and to Potion of Madness. ("That's my 8/8 Skeleton, thank you very much.") It could work in a deck that buffs minions, singly or in groups. If you're running two in a deck, you only need one to fire off its Deathrattle to be in a pretty strong board position. This is the kind of card that would be brilliant in a sideboard (Queuing against Freeze Mage? Why, hello, Skelemancer! ), but in the absence of such a feature, given the finickiness of its Deathrattle, I don't think it can merit any better than a Poor rating. We've already discussed a few minions with the Spell Damage mechanic. Most of them end up being very poor choices, and as we have already seen, very few of them see play as a result. The Spellweaver is no different. Spell Damage +2 is pretty good, but a 6-Mana 4/4 body is just not going to work with it. The Evolved Kobold, which is already not a very strong card, is found in Wild format Freeze Mage (where Emperor Thaurissan and Ice Lance can still be found). I'm not aware of it being found in any other spell damage combo deck. (Most of these seem to rely on Malygos instead.) Evolved Kobold could be made to work if you could stitch together enough cheap damage spells to burst your opponent down, and Malygos works in (Wild) druid because it can do 26 damage for 2 Mana and 4 spells (requiring only a Coin or Innervate to make the combo work). 6 Mana is just too much to pay, making this card Terrible. Finally, we have the Venomancer. In previous posts, I've noted that bestowing the Poisonous attribute on a minion, courtesy of the Adapt mechanic, is often an incredibly powerful play, while minions with Poisonous are almost always unplayable. 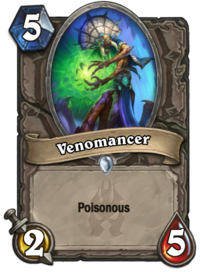 Venomancer's poison just can't make up for the 2/5 body you get when spending 5 Mana. It's just Terrible. There are only a few cards from these rarity levels among Neutral cards left to be reviewed, so I'll review them all together. the Lich King sort them out. 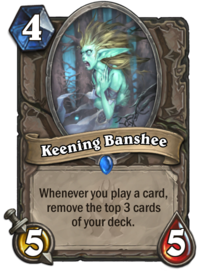 The Keening Banshee has a strong body for its Mana cost, but the downside of the card is incredibly bad. I'd rather play the Hungry Dragon (same Mana cost, slightly better stats, far superior downside) or the Unlicensed Apothecary, whose downside is pretty hefty, but who only costs 3 Mana, or King Mukla (for much the same reason as the Unlicensed Apothecary, only his downside isn't as bad as its is). 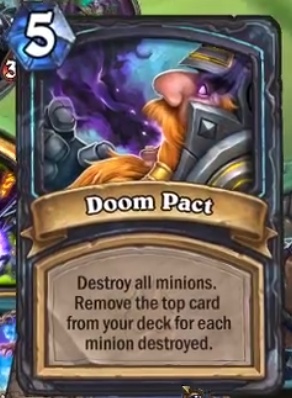 The downside of this card is slightly better than that of the Fel Reaver, in the sense that you control when it happens, meaning you might be able to trade with this minion and destroy it before you pay any cost. As a 5/5 body, it does put pressure on your opponent, meaning the Banshee could be killed via minions or spells before you pay any cost. However, the Fel Reaver's downside came attached to an 8/8 body, which could end the game if you couldn't deal with it. I just don't think a 5/5 body, especially for 4 Mana, can make up for losing 3 cards from your deck. I've seen people defend Fel Reaver back in the day, or pooh-pooh the effect of Gnomeferatu, on the basis that thinning your deck helps you reach your win conditions, or that you won't necessarily miss the cards that are milled. The thing is, the best decks in the meta are highly optimised, with every single card in the deck playing an essential role. You won't have many cards in the deck that you won't miss when they're gone. (If you did, it wouldn't be a very good deck, would it?) Milling isn't as dangerous for aggressive decks that don't run card draw, especially Pirate Warrior, which can often win games with its opening hand, but those decks won't run this card. The decks that might appreciate this minion's ability to contest the board are the kinds of decks that would get killed by its drawback. This card is just Terrible. The Drakkari Enchanter is a slightly underpowered body for its Mana cost. It ostensibly makes up for this with its ongoing effect, which is very good for minions whose own special abilities trigger at the end of your turn. 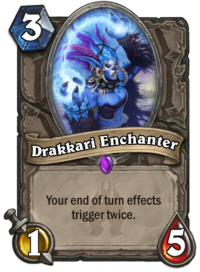 There are actually quite a few minions with those very triggers that stand to benefit greatly from having the Drakkari Enchanter around. (Both Ragnaros cards spring to mind, as do the minions that draw or generate cards, or buff your hand, or self-buff, or generate tokens.) The downside is most of the best such minions are too expensive to play along with the Enchanter simultaneously. Other strong choices probably can't afford to fit this card in their deck (such as Secret mage with Ethereal Arcanist or any shaman with Mana Tide Totem). Paladin decks running Grimestreet Enforcer and Ragnaros, Lightlord (and maybe also the Firelord in Wild, especially since you could also have Thaurissan) might see clear to add this to their decklists. A 3 Mana minion is just low-cost enough that you don't mind it being removal or transform bait, especially since most such spells or minions that achieve those effects cost more than 3 Mana. The niche potential is nice, but not enough, I think, to lift this card out of Poor status. 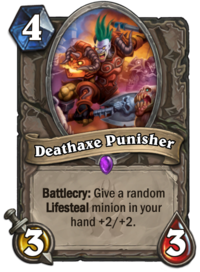 The Deathaxe Punisher buffs a minion in your hand with Lifesteal, but at substantial cost to itself: it's a 3/3 minion for 4 Mana, which is very weak for the cost (3/3 is weak for a 3-Mana minion who doesn't have some correspondingly good special ability, after all). 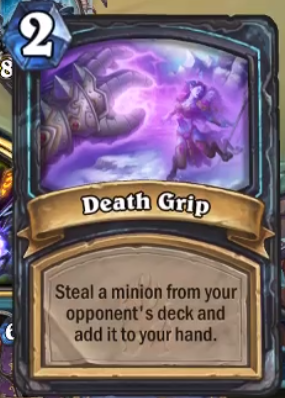 For one more Mana, you can play a Grimestreet Enforcer that buffs your entire hand. For two more Mana, you can equip your Lifesteal minion with a Spikeridged Steed. You could play a Lifesteal minion into a decent-sized board and then buff it all with several druid spells. There are just better options than using up a precious spot in your deck for this. It's Terrible. 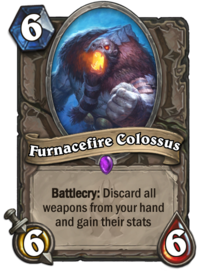 Last but not least among the non-legendary neutral minions, is the Furnacefire Colossus. There aren't a lot of 6/6 minions for 6 Mana that see play, because it's a mediocre statline for that cost. (Ironically, a lot of 6-Mana minions that do see play often have worse stats, but really strong abilities. See one Jackson, Reno, for instance.) The only ones I can recall seeing regular play were the Drakonid Crusher (and then only in a Dragon warrior deck), Dread Infernal, and Mysterious Challenger. Kabal Trafficker has seen some infrequent play, but is pretty niche. Like most cards with uninspiring statlines, it all depends on the additional abilities. And Furnacefire Colossus has a pretty poor Battlecry. Why is this so? You're not going to run this minion in the kind of deck that would use a weapon you don't care about losing, and if you're running any decent weapons in your deck (Arcanite Reaper, Truesilver Champion, and Jade Claws spring to mind), there's no way you want to discard them to buff a minion. The loss of tempo and of action economy is just too great. All in all, another disappointing and Terrible card. The card reveal on Monday brought us the last two neutral Legendary minions. Arfus is, it seems, original to Hearthstone. It is, of course, a way to add some levity to a pretty dark expansion. 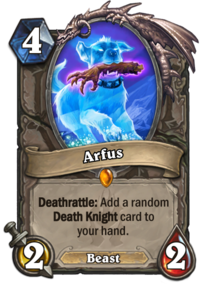 Arfus has an extremely powerful Deathrattle - adding a random Death Knight card (of which more later) - and pays for it by having a very weak body for his Mana cost. He is very weak against certain match-ups - shaman's Transform effects and Priest mind-control effects, for instance, and his body makes him a poor choice when facing aggressive and midrange decks. If this expansion enables the existence of a viable control-oriented Deathrattle hunter deck that makes use of the cards that trigger Deathrattles (such as Play Dead), Arfus could be a niche in that deck, especially if you can get one or two cards in that way. Death Knight cards are shaping up to be powerful, but his body and specific vulnerabilities are pretty hefty. I think he's Poor, but if he finds a home in a hunter deck of some kind, he might be upgraded to Fair. Finally, the big guy himself, The Lich King. He's basically an Ironbark Protector, stat and cost-wise. 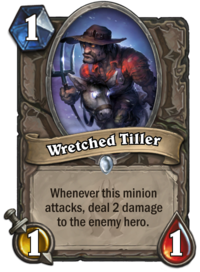 Normally, that would be pretty poor, but he comes with an incredible end-of-turn trigger: he adds a random Death Knight card to your hand, making him something like Ysera with the body of a Ragnaros. The fact that you're only ever guaranteed a single Death Knight card is a downside, to be sure, but like Ysera or Ragnaros, The Lich King is a finisher. If your opponent can't deal with his body, or with the cards he generates, he will win you the game. The reason for this is the quality of the Death Knight cards, as we shall soon see. The Lich King is an Excellent card on the back of the Death Knight cards. Most of the value from Arfus and the Lich King comes from the Death Knight cards they generate, so let's look at these cards and see how they fare. (Unlike most card pictures, these are extracted from a different site than the Hearthstone Gamepedia.) Because these cards aren't collectible, even though I'm giving them ratings, they won't appear in the running tally. Had enough of the death yet? ... and we're back with the death. Death and Decay is an incredibly efficient board clear, dealing 3 damage to all enemies (and only enemies) for 3 Mana. By way of comparison, other 3-Mana AoE spells and minion effects are either weaker (such as Fan of Knives or Ravaging Ghoul), have some downside associated with them (such as Volcanic Potion or Lightning Storm), or are associated with minions with subpar bodies (such as Twilight Flamecaller) - or even have some combination of these problems that Death and Decay does not possess. It's an Excellent card. Army of the Dead is not as unambiguously good. It's an excellent card in a minion-heavy deck, such as many current paladin decks, and very weak in a spell-heavy deck (most mage decks, for instance). It also summons minions, meaning Battlecry effects don't trigger. It also has the downside of bringing you closer to fatigue, but if it ends up being a game-winning play, I suppose you don't really care. (A synergy that occurs to me is with the priest legendary minion. If you've got a bloated deck full of your opponent's cards, you don't care in the slightest that you'll burn through a few with this card.) Because it's so situational, but exceptionally powerful in the right situation, I think it's Fair. 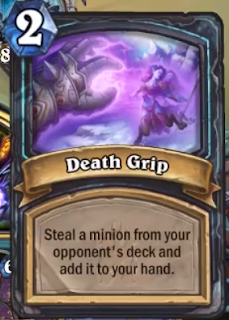 Death Grip is a very powerful card for 2 Mana. Not only do you remove a card from your opponent's deck, but you're adding it to your hand. Since you're likely to see these cards in late-game situations, you're playing this against a control deck and stand a good chance at getting something really good, along with denying it to your opponent. This is another Excellent card. Doom Pact has an exceptionally powerful effect, being a 5 Mana Twisting Nether, but it comes with a significant downside. You have to make sure to play this when your opponent has only a few minions, preferably powerful ones, on the board, or when you've already gone into fatigue and can't lose any cards to its effect. It's situational nature and significant downside make it a Fair card, at best. 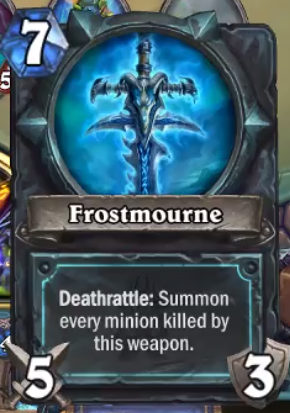 No Lich King card would be complete without access to the Lich King's iconic signature weapon, Frostmourne. 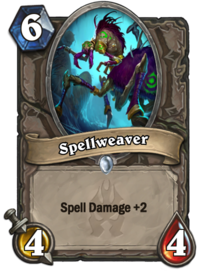 At 7 Mana, it's really expensive, but depending on what you used it for, you could get some incredible board swings out of it, and 15 damage for 7 Mana that you can assign flexibly is actually really strong. And of course, if The Lich King survives, you might get more than one Frostmourne to play as you go. Another Excellent card (as it should be). 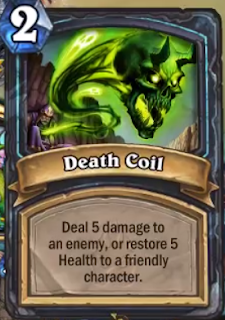 Death Coil can either do 5 damage to any enemy (without the restriction imposed by, say, Shadow Strike) or heal yourself or a minion for 5, whatever you think is more important. All for 2 Mana. So, yeah, Excellent card. 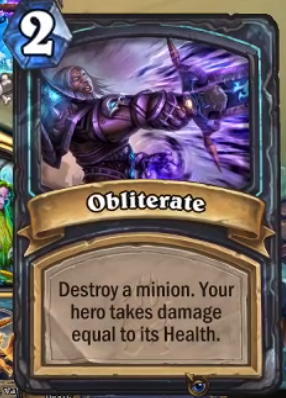 Obliterate is very cost-effective removal, unconditionally allowing you to destroy a minion for 2 Mana. It comes with a downside, in that you take damage when you use it. This damage could end up being very significant if you're using it on a Ragnaros or Ysera. It's a big enough downside that the card is Good (because a 2 Mana unrestricted removal card is just so good that it's hard for a downside to make it less than Excellent). 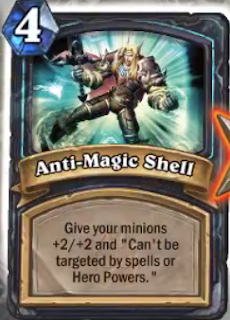 Finally, there is Anti-Magic Shell. It's a solid ability when it affects even just a single, powerful card (a Ragnaros, Ysera, or of course The Lich King himself.) For any other minions, it probably pays off at 2 buffed minions, and is just amazing if you have 3 or more minions on the board when you play it. If you have a big board, the extra damage from the minion attacks could very well end the game on the spot. This is yet another Excellent card. Only a handful of class cards to go!